I knew I would get your attention by the title of this post. Now that I have your attention I can tell you about the Pagan history surrounding Easter… you know… the goddess of reproduction: Ishtar. That’s where the bunnies and eggs come in to play folks. It’s a well documented history lesson for those that pay attention to history. No one can really refute this. It is true. Easter lands on the first Sunday after the first full moon after the spring equinox. Not really the death and resurrection of Christ. But that doesn’t have to stop us from thinking about Him. That’s why I stay away from egg hunts and such things that do not represent His death and resurrection. In fact, I think they are just a diversion from Jesus the same way Santa is a diversion from thinking about Jesus around Christmas. I don’t criticize people for doing otherwise… I just choose to do things differently. Different doesn’t have to be “against” something or offensive. Actually, different can be offensive. I mean, Jesus was different and the way He worked was very offensive to many. So I want to be different too, but in a way that shouts Jesus and not condemnation. I have a set of these in my display cabinet where they can look pretty. Tonight at Serendipity we talked about what is on a lot of people’s minds – Good Friday, specifically the cross. While the world is thinking about the celebration most Christians observe, it is good to talk about Jesus, and specifically the cross. The world and Christians have made the cross such a pretty thing, but the cross was nothing near pretty. We wear it as jewelry. We put it up on the walls of our homes. We use them as bookends on our shelves (see photo)… We sand and polish the wood and put expensive purple fabric draped on it. Is this what we do with the symbol of the cross? 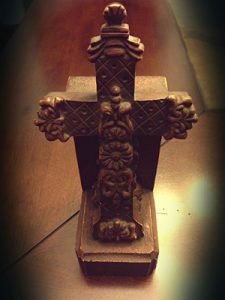 We make the cross look so comfortable, but the cross of Christ was anything but comfortable and it was far from pretty. My brother made this for me years ago. He knew how much Jesus meant to me so he made it for me. The cross is not as important as His death. If He were to die today for our sins, it would be through a different medium. So in essence, the cross just happened to be the way criminals were executed. But nevertheless, He died on one. That’s what makes the cross beautiful. God takes what is foolishness from a human perspective and has no glory or honor at all… He finds the least likely symbol and uses it. That’s why I believe He can use me too for His glory. Jesus’s pain was brutal. The worldly punishment He received was immense. But the punishment of our sins upon Him was what killed Him. It wasn’t really the nails that killed Him. It was that cup of wrath that gets poured out on the wicked in the end. In that cup was the guilt and shame that we deserve upon ourselves, but Jesus took that cup at “full strength” (see Revelation 14:10). It was the weight of sin… the enormous pressure of guilt and shame from my sins, your’s, and everyone that has ever existed and will exist. That is why He died so suddenly and why the Roman guards were amazed that He was already dead. If the cross that we are carrying (Matthew 10:38; 16:24) is comfortable, then maybe it is time to rethink what we are carrying. His cross was not popular. 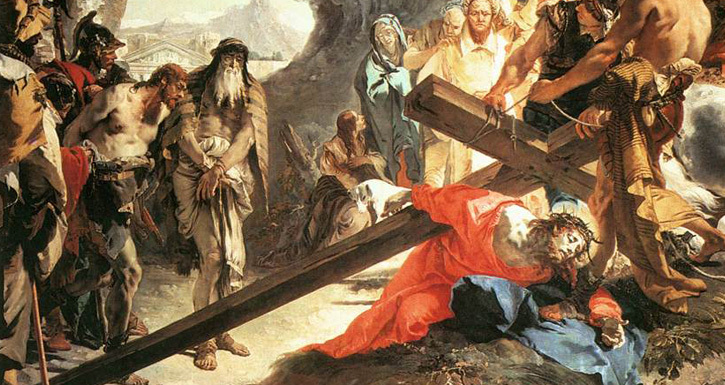 His cross was not what “everyone else was doing.” His cross was not comfortable. So this Good Friday, lets think about what it really means in terms of what Jesus did. Let’s look at it for what it really was. Without the death of Christ, there is no resurrection. Rejoice that He has chosen to die for you and for me.